An adhesive is a substance that sticks to the surface of an object such that two surfaces become bonded. A typical home improvement store carries many different adhesives for many different applications. Why are there so many adhesives? The answer is found in examining how an adhesive works and, in particular, what happens at the molecular level. The interaction of molecules is known as intermolecular bonding, or secondary bonding. Primary bonding, also known as intramolecular bonding, is the interaction of atoms within a molecule and includes covalent and polar covalent bonding. Secondary bonding includes dipole–dipole bonding (the interaction of molecules that have a permanent net dipole moment) and hydrogen bonding (an interaction that occurs when a hydrogen atom is bonded to an N, O, or F atom in a molecule). Some adhesives, such as this wood adhesive, are used only with specific substrates because of the cure time needed to allow for good bonding. the simplest polymers is polyethylene. The mer (basic building block of the polymer) is ethylene, H 2 C=CH 2 . The addition of an initiator (R·) causes the formation of the radical RCH 2 CH 2 ·. A radical is a species that has an unpaired electron and is very reactive because it seeks the source of electrons. This radical will attach the ethylene mer (the double bond in ethylene is rich in electrons) to start a chain reaction that continues until very large polymer molecules form. This and other forms of polymerization processes are the basis for the formulation of polymers. This process is known as curing when dealing with adhesives. Two criteria must be met in order for a molecule to possess a permanent net dipole moment: (1) an unequal sharing of electrons within the molecule such that one or more intramolecular bonds has a partial positive end and a partial negative end, and (2) a geometry such that the vector sum of the individual dipole moments does not equal zero. The ability of an atom within a molecule to attract electrons is known as electronegativity, a concept proposed by Linus Pauling who established a table of relative electronegativities. In Pauling's table, fluorine is the most electronegative element and is given the value of 4.0. The greater the difference in electronegativity between two atoms within a molecule, the larger is the dipole moment in that bond. Because the bond between two atoms having unequal electronegativities has a partial positive end and a partial negative end, it is said to be a polar bond. If the geometry of the molecule is such that the vector sum of all of the dipole moments does not equal zero, then the molecule is polar. The electronegativities for carbon and oxygen are 2.5 and 3.5, respectively; therefore, the carbon–oxygen bond is a polar bond. A carbon dioxide molecule has two carbon–oxygen bonds; however, its geometry is such that the vector sum of the two dipole moments equals zero, and thus carbon dioxide is a nonpolar molecule. The electronegativity of hydrogen is 2.1, thus a hydrogen–oxygen bond would be polar. A water molecule has two hydrogen–oxygen bonds. The geometry of a water molecule (the H–O–H bond angle is 104.5°) is nonsymmetrical, hence the vector sum of the dipole moments is not equal to zero and water is a polar molecule. Polar molecules will attract other polar molecules because of their net dipole moments. Water molecules, however, have an additional attraction for one another, based on hydrogen bonding. This attraction is so strong that, although water is a small molecule and small molecules tend to be gases, water is a liquid at room temperature. This aspect of the chemistry of water demonstrates that hydrogen bonding is a relatively strong force that can hold molecules together. So how does this relate to the many types of adhesive products that exist? In order for an adhesive to bond (hold together) two surfaces (substrates), there must be several types of interaction between the adhesive and both substrates. The first type of interaction is that the adhesive must wet the substrate, meaning that the adhesive must spread itself out into a film that covers the substrate surface. In order for this to happen, the adhesive must have a low enough viscosity so that it will flow. Viscosity is the resistance of a liquid to flow. Water has a low viscosity whereas honey has a high viscosity. Because viscosity is temperature dependent, the application of a cold adhesive to a substrate, or the application of an adhesive to a cold substrate, may result in poor wetting. Another factor that affects wetting is the relative strengths of cohesive forces (between like molecules, such as two adhesive molecules) and those of adhesive forces (between unlike molecules, such as an adhesive molecule and a substrate molecule). If the cohesive forces among adhesive molecules are weaker than the adhesive forces between the adhesive molecules and the substrate surface, then the adhesive molecules will spread out over the substrate and wet its surface. An adhesive that has a relatively low viscosity and is able to wet the substrate surface will flow into any tiny cracks or pores on the substrate surface, thus promoting what is known as mechanical bonding. Mechanical bonding increases the strength of an adhesive bond and, as a result, a forced separation of the two substrate surfaces is more apt to tear the substrate surfaces. Mechanical bonding is one of several ways that an adhesive bonds substrates. All surfaces, except those that are highly polished, have pores. If the adhesive flows into these pores and then polymerizes, a mechanical bond is formed. It is similar to placing a wick into liquid candle wax. Once the wax solidifies the wick can not be easily removed. A mechanical bond has formed. Table 1. Common adhesives and their uses. large molecules. The reason for the longer cure time in the bonding of wood has to do with chemical reactions (between adhesive and substrate) that affect the rate at which the cyanoacrylate molecules polymerize. A typical cyanoacrylate product is a low viscosity liquid that readily flows over a substrate's surface. When the cyanoacrylate molecules encounter a basic environment, the small molecules within the adhesive polymerize. Many common surfaces tend to be basic, so a cyanoacrylate adhesive works fine in these instances; wood, however, tends to have an acidic surface, and because an acidic environment will inhibit polymerization, cure time is increased. Cyanoacrylates are not appropriate for the bonding of the steel parts of an automobile, because of the environments that the car will be exposed to. Those environments include such things as rain, variations in temperature, exposure to solvents (such as gasoline, oil, and windshield washer solution), ozone, acid rain , salt spray, and ultraviolet light from the Sun. (A more appropriate adhesive for car parts would be an epoxy-based adhesive.) Another example of a "special" adhesive would be the one used to attach a new rearview mirror in an automobile. Because the cured adhesive in this case will be exposed to wide variations in temperature and to an extremely large amount of ultraviolet light from the Sun for prolonged periods of time, an adhesive formulated specifically for these conditions should be used. Finally, the strength and permanence of the bond formed between adhesive and substrate must be considered when one is selecting an adhesive. Most of the time it is desirable to have maximum strength and permanence; the very common Post-it note, however, is a counterexample. Its adhesive is neither strong nor permanent. The adhesive formulation that eventually led to the Post-it was initially considered a failure because of the adhesive's weakness. It was while singing in his church choir that Arthur Fry of the Minnesota Mining & Manufacturing Company (3M) envisioned a potential use for what seemed to be a useless material. 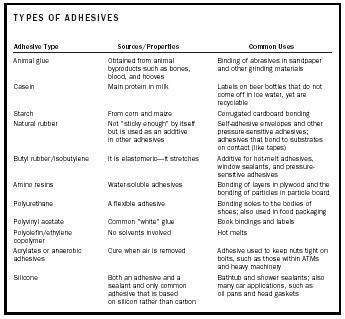 Table 1 lists some common types of adhesives and their uses. Because of the different possible substrates and combinations of substrates, and because adhesives are subject to such a range of environmental conditions, it is no wonder that there are so many types of adhesives on the market. However, if one has some knowledge of how adhesives bond to substrates and the types of substrates being bonded, the task of selecting adhesives will not be overwhelming. SEE ALSO Bonding ; Pauling, Linus . Doyle, Daryl J. (1989). "A Review of Ultraviolet (UV) Radiation as an Adhesive Curing Agent." Society of Manufacturing Engineers Technical Paper AD89–534, Adhesives '89, September 12–14, 1989, Atlanta, Georgia. Doyle, Daryl J. (1990). "Criteria for Proper Adhesive Selection: From Application to Viscosity." Society of Manufacturing Engineers Technical Paper AD90–450, Adhesives '90, October 1–4, 1990, Schaumburg, Illinois. Doyle, Daryl J. (1990). 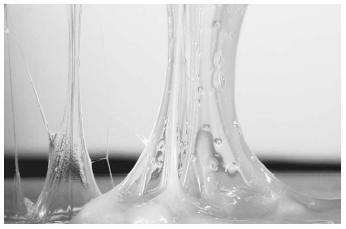 "Viscosity and Its Importance to Adhesive Dispensing." Society of Manufacturing Engineers Technical Paper AD90–710, Adhesive Technology for Automotive Engineering Applications, November 1–2, 1990, Dearborn, Michigan. Fry, Arthur L. (1989). "The Choir Singer's Bookmark." Guideposts. Plummer, Christine (1993). "The Story of Post-it™ Notes." Chem Matters.